On June 25-28, 2012 CARIS hosted the largest gathering of CARIS users at CARIS 2012, its 14th International User Group Conference. The four-day conference saw a record number of delegates in attendance from a variety of nations across the globe from government organizations, defence, hydrographic offices, private survey companies, academic institutes, and industry manufacturers and consultants. 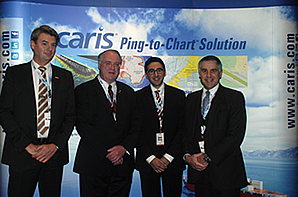 At CARIS 2012 (left to right): Geerten Blessing, CARIS BV, Managing Director; The Honourable Keith Ashfield, Minister of Fisheries and Oceans; Dr. Mark Masry, CARIS, Research and Development Manager; and Ian Moncrieff CBE, UKHO, Chief Executive. During the first two days of conference delegates engaged in user group meetings and boot camps. The HPD, Bathy DataBASE and the first ever HIPS and SIPS user group meetings brought together diverse users which resulted in an excellent cross section of the use of CARIS products as well as an in-depth look at future development. The concurrent boot camps provided the first opportunity for hands-on practical training in Paper Chart Composer and the popular HIPS and SIPS boot camp was packed with novice and intermediate users honing their data processing skills as well as learning some new features such as Water Column Imaging. CARIS 2012 delegates during the main conference session. During the main conference session the opening keynote address was given by the Honourable Keith Ashfield, followed by inspirational speeches by Rear Admiral Ian Moncrieff CBE , Dr. Leslie Sautter and CARIS' Dr. Mark Masry who shared some insight on the future development of CARIS products. The technical papers that followed were of the highest quality and widely respected among attendees. Papers presented were on topics that included discovery, data processing, data analysis and chart production. During the breaks delegates indulged in research posters presented by students from a variety of academic institutes studying in the geospatial industry. This was also an opportunity for delegates to interact with many industry partners who were exhibiting at the conference. Throughout the duration of the conference delegates were treated to a variety of social networking events. Delegates took in the beauty and culture of Vancouver including a beautiful evening cruise along the shoreline. While onboard delegates took in breathtaking views of Vancouver's cityscape and monumental landmarks and joined us in the celebration of 20 years of HIPS. 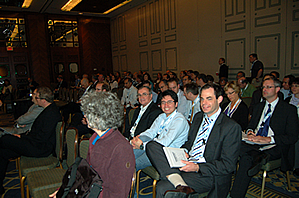 CARIS 2012 proved to be an outstanding event filled with exceptional technical expertise, user interactions and the latest CARIS advancements. We thank all that attended and look forward to seeing you at the next CARIS conference.